Zeagler Farms offers handcrafted, specialty wood flooring in a wide variety of flooring types, colors and sizes. Zeagler Farms Hand Crafted Flooring Inc. is a family owned and operated company based in Sylvania, GA and Bluffton, SC that specializes in handcrafted, specialty wood flooring. In 1987, our owner, Ainsworth Zeagler, decided to undertake a remodeling project in his home, built by his great-grandfather in 1883. While the home featured beautiful heart pine flooring, he wanted to incorporate wide plank flooring into the 1,500-square-foot addition he was working on. Four months later, when the project was finished, Ainsworth was overwhelmed by the positive response he received from friends and family. That’s when Zeagler Farms Hand Crafted Flooring Inc. was born. Since then, the company has continued to grow and still remains committed to delivering the highest quality products and customer service. If you’re searching for a rustic, textured feel for your home, the Rustic Series is the perfect place to start exploring the options we have to offer. The surface of these boards haven’t been planed, resulting in a textured look. However, they have been sanded to ensure a smooth-to-the-touch feel. The boards are finished with hand-hewn edges and, depending on the color, Tung oil or poly. Board widths vary between 8 and 16 inches, and they are 1/2 inch thick. If you’re in love with the texture and staining of oyster shells, this flooring was created just for you. 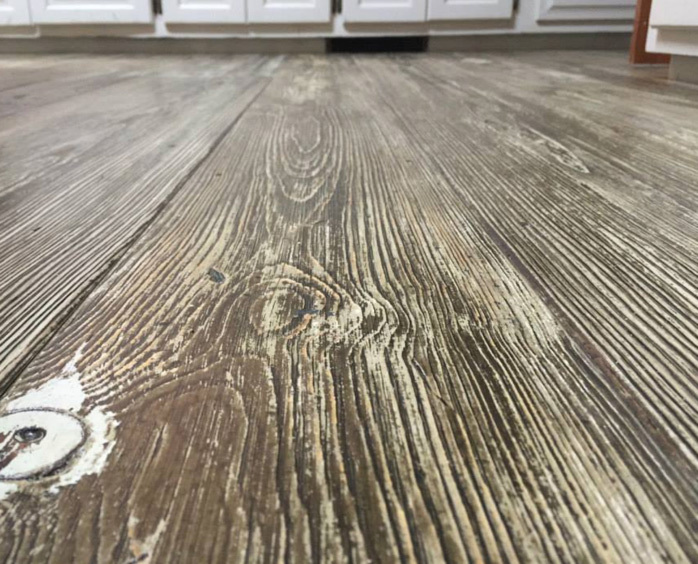 The boards are the same as those used with our rustic flooring options, but the finishing process is truly one of a kind. Board widths vary between 8 and 16 inches, are 1/2 inch thick and come prefinished with a matte water-based poly. This series will add a classic, antique look to any room in your home. It is our most popular choice and offers versatility like no other. The surface of the boards has been planed and hand-distressed, and the edges are hand-hewn. Board widths vary from 6 to 14 inches, and are finished with Tung oil to give it the luster of old oiled floors. The boards in the floor are 5/8 inch thick and feature a 3/8 inch deep tongue and groove. The Driftwood Series is a wire brushed floor that is stained in a two part staining process to create it's unique look. This flooring has enhance grain and full of elegant texture. The widths of the 5/8 inch boards are random and vary from 6 to 14 inches. The edges and ends are hand hewn and either a tung oil or a poly is used to provide a prefinished product.